Hearing loss is caused by the dysfunction of the inner ear resulting in a loss of hearing. This differs from those who are deaf as a person who is deaf is unable to hear anything at all, whereas a person with a hearing loss can still partially hear others. For those with a hearing loss, they can hear using hearing aids to amplifying sounds.Even at the highest possible volume, a person who is deaf is unable to hear. As many cases of hearing loss are untreatable, it is important to prevent your hearing from worsening. Hearing loss can be caused by several factors including age, illness, and genetics. Some illnesses put patients at a high risk of hearing loss as it can interfere with the ears’ blood supply. These illnesses include heart disease, high blood pressure, and diabetes. In addition, otosclerosis is a bone disease which can destroy the inner ear causing hearing loss. Trauma, such as a punctured eardrum, can also cause hearing loss. 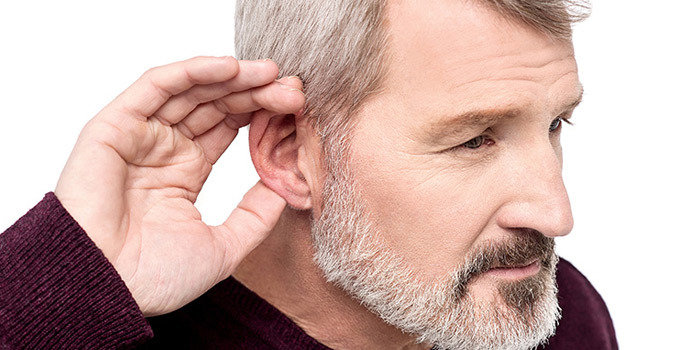 Hearing loss signs and symptoms may range from mild to severe. Signs of hearing loss include difficulty hearing people over the phone or while conversing, being unable to hear in noisy environments, and having difficulty hearing high pitched frequencies. Treatments for a hearing loss vary depending on the severity of one’s symptoms. One option is to remove earwax blockage by either loosening it with oil or flushing it out in order to remove the blockage. For patients who have had a traumatic ear injury or repeated ear infections, surgical procedures may be necessary to improve their hearing. Another treatment option is wearing a hearing aid to amplify the volume of sound electronically. This can help to strengthen sounds making it easier to hear others when conversing. Lastly, cochlear implants help patients with severe hearing loss as the implant compensates for damaged or nonworking parts of the inner ear. By treating hearing loss, individuals can regain their confidence when communicating with others. To be eligible for the Disability Tax Credit, your hearing loss must be severe and prolonged, lasting over 12 months. Form 2201, the Disability Tax Credit Certificate, includes the disability section hearing. Please note that your hearing loss must restrictyour basic activities of daily living, and the form must be completed by a qualified practitioner. Before applying for the disability tax credit program, we would like to educate you on who is eligible for the tax credit. You are eligible if you have difficulties with your hearing affecting your everyday living. For a hearing impairment, it must take an inordinate amount of time to hear. How To Apply for Disability Tax Credit for Hearing Loss? To apply, our experts will assist you in filling out form T2201 where you will need to get your medical practitioner to complete this form. This will ask your doctor to describe how you are impaired by your disability. It is important to be descriptive in this section as a patient can be affected in a variety of ways by Hearing Loss.